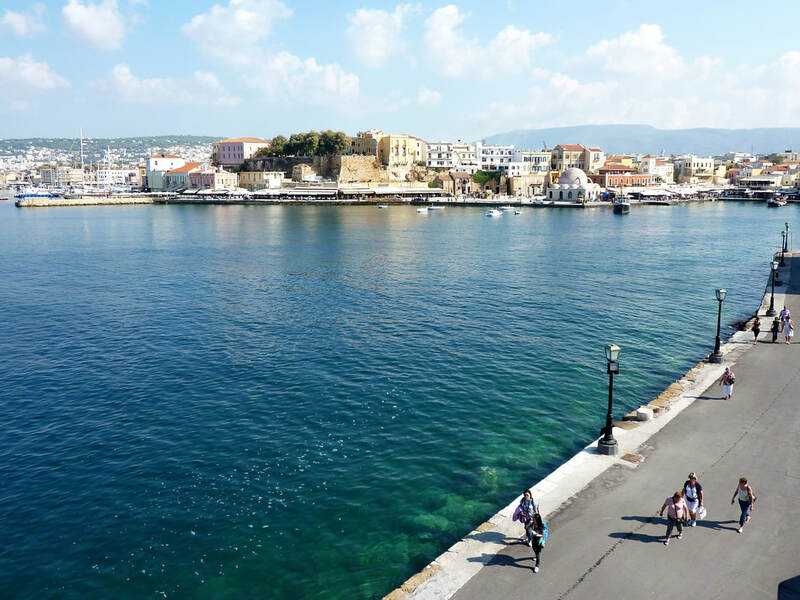 April in Crete is the start of the season. Beaches are empty without sunbeds or umbrellas to enjoy long walks. The temperature of the sea is still rather chilly but not as cold as the seas in the north of Europe. The weather can be pleasant & in the high teens & maybe even early 20's. The evenings are chillly & you need a light jacket. Accommodations usually have air conditioning so you can use them for heating. Shop owners in resorts are getting organized & alot of painting is usually done at this time of year. 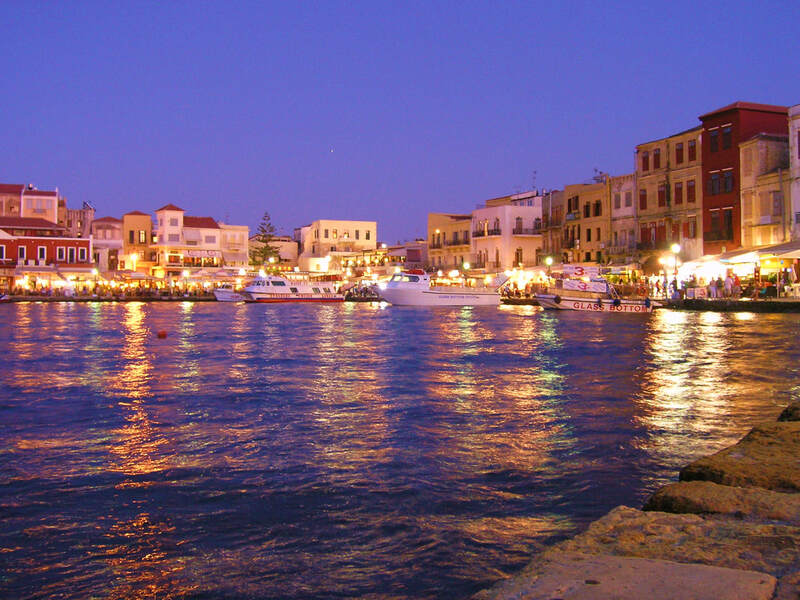 Easter usually falls in April & the Greek Orthodox holy week is very interesting & rather a large festive time on Crete. The wildflowers are in full bloom. Even pink tulips on the Omalos plain. 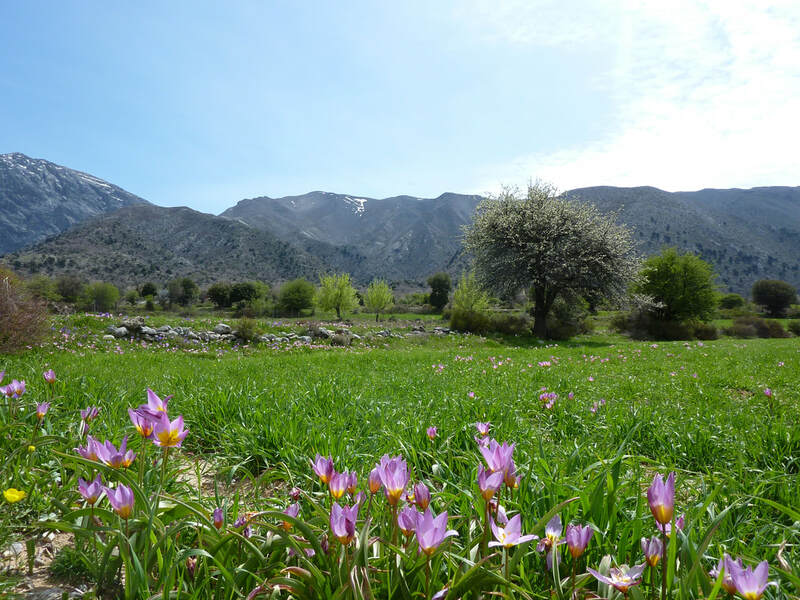 Although the Samaria Gorge is closed you can still drive up to admire the view & the tulips! Walking in the countryside at this time of year is beautiful, not too hot & the landscape is lush & green from all the winter rain. The White Mountains still have snow on the peacks & are lovely to gaze at when the sunsets upon them. May on Crete is a bit warmer than April. The snow on the White Mountains is melting rapidly. Most shops in resorts are open & ready for business. Temperatures are in the low to mid 20's. It is still a bit chilly in the evenings so you need to wear a light jacket at night when out. By mid-May the beaches have come alive with sunbeds & umbrellas ready for business. By the end of the month it is getting warmer up to high 20's and feeling very comfortable. You do not need to use air conditioners for heat or cool during the month of May. There are mosquitoes at this time of year so come prepared if you are prone to getting bitten. 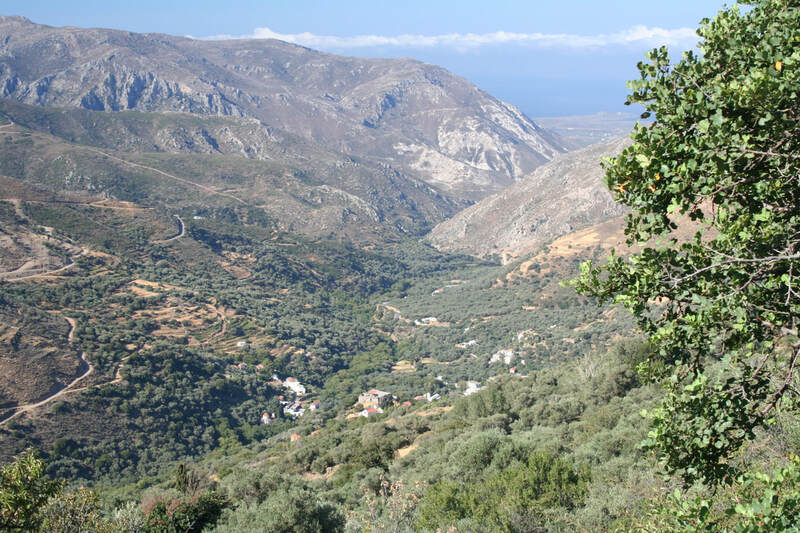 The Samaria gorge is open for walkers & the there is a freshness in the air as summer is about to start. Beaches are still very quiet at this time of year. The roads are also not very busy, especially inland. Some of the boat trips are starting to run as well. It's all happening in the month of August. Many Greeks have holidays over the 15th of August, so the beaches are busier. Roads are busier & there is a buzz wherever you go. Many celebrations, weddings and festivals happen in the month of August, so there may be live music in the evenings up until the wee hours of the morning. If you haven't booked accommodation, it is difficult to find something as most places are sold out for the month of August. Car hire companies struggle and there is a lack of cars for rental during the month of August with so many visitors on the island. All of the excursions are running in full swing & are quite busy. It is hot & there is the Meltemi, so the sea can get rough on some days & windy. Even the quietest beaches, in remote areas will have some people on them. The more popular resorts & beaches are full. Evenings are warm & the tsikados are buzzing away in the trees from sunrise to sunset. The smell of jazmine is in the air. Once the holiday of 15th of August -25th of August is over, things start to slow down a bit as soon as the children are getting prepared for the start of the new school year. Things are starting to wind down as most of the children are back at school. So beaches are quieter and the seas are calm & very warm at this time of year. The evenings are getting a bit cooler but the temperatures in September are lovely during the day time. There may be an odd day of rain in September and in October the possibility of rain is higher. If it does rain, the locals are very happy as the earth & farmers need rain after a long dry summer. The landscape on Crete is rather brown as it is so dry during the summer. The grapes will get picked & made into wine & come October the ritual Raki making process is done. Chestnuts at the end of October are out & you can enjoy the festivities in Elos. A jacket is needed at this time of the year for the cooler evenings. Towards the end of October many of the smaller resorts are winding down for the season, so you may have to travel to the larger towns for evening meals. It is still a beautiful time of year and the sea is very warm as it has collected all of the summer sun's rays. In October the leaves are turning colours. The tsikados have stopped buzzing & the traffic on all roads is much lighter. The museums and archaeological sites are also not as busy as they are in the height of the summer. Walking is great in September and October as it cooler during the day as well.